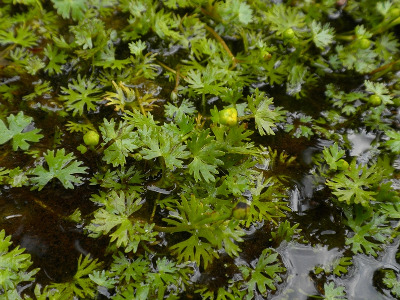 Ranunculus gmelinii (D. Don.) DC. Edges of rivers, streams, lakes, and ponds (in water and on banks); pools in bogs and cedar swamps. Very local southward. The submersed parts are sometimes said to be more pubescent than the aerial parts, which would be a remarkable reversal of the usual situation in aquatic plants if true. Certainly in our material, submersed parts are glabrous, while terrestrial parts may sometimes be ± strigose. MICHIGAN FLORA ONLINE. A. A. Reznicek, E. G. Voss, & B. S. Walters. February 2011. University of Michigan. Web. April 19, 2019. https://michiganflora.net/species.aspx?id=2390.